Technical support to other technical disciplines on submission of design documentation. Geo-Environmental Services Limited, ‘Geo-Environmental’, was instructed by PJH Development Consultancy Services on behalf of their collective clients to undertake an investigation of the geotechnical and environmental factors pertaining to the proposed development on the site of a hotel and leisure complex in Hampshire. The investigation was required to be sufficient for a development consortium to be able to progress with planning and design. The project comprised of a major new development which included c. 1400 new dwellings together with private and communal gardens, a school, community facilities including sports pitches, public open space and allotments. The investigation was to be undertaken on a working hotel and golf course complex, with a strategic oil pipeline running beneath the site. The difficulties of working in an environment open to members of the public and the requirement to keep any disruption to a minimum. The on-site investigation was undertaken over a three week period during September 2013. The full scope of works included hundreds of exploratory holes and associated sampling. This was a large scope to co-ordinate and implement in three weeks and all of this had to be done whilst ensuring that any disturbance to the golf course and surrounding hotel and leisure complex was kept to a minimum. To add to the complexity of the project a strategic oil pipeline, owned by the Esso Petroleum Company ran through the centre of the site and their representatives, Fisher German, needed to be satisfied on the location of any exploratory hole locations in the area. The first stage in the process was to undertake a walkover of the site and identify where the exploratory holes needed to be situated and to meet with the various stakeholders. The green keepers were involved in this process as they had first hand experience of working on the course. In addition to this, the visit was used as an opportunity to identify any potential risks or issues that could impact health and safety or timescales. A resources plan was created and tasks scheduled using our on-line project management tool.Within a day of the site visit, risk assessment and method statements were produced and a preliminary investigation plan was then drawn up in AutoCAD which detailed each of the investigation points, and whether a cable percussive rig, window sampler rig or trial pit was required. The risk assessments and method statements were submitted to the Clients Health and Safety representative for review prior to the works commencing. The position of each of the proposed exploratory positions was then surveyed by a specialist surveying team and a revised site investigation plan and co-ordinates for each position were supplied to the project manager and Fisher German, whose interest was the Esso pipeline running under the site. This was done at a very early stage in the project to ensure that the investigation schedule was agreed and that there would be no delays in the schedule. The order of work for each day was discussed with the green keepers in order to cause as little disruption as possible to the golfers. It was necessary to work outside of normal working hours at some locations which were constantly busy during the day, such as the golf driving range. Progress was monitored on the project using our online project management system and any potential delays identified and mitigated. The rapid transfer of investigation data from the site to the Project Manager enabled testing to commence at an early stage of the investigation and facilitated an effective logistical control in terms of supplies to site, transfer of samples to testing laboratories and management of personnel and operations on site. As a result of how we managed the project it was delivered on-time and budget. Successful delivery of such a project in those timescales and working conditions requires quality procedures and a strong health and safety methodology. 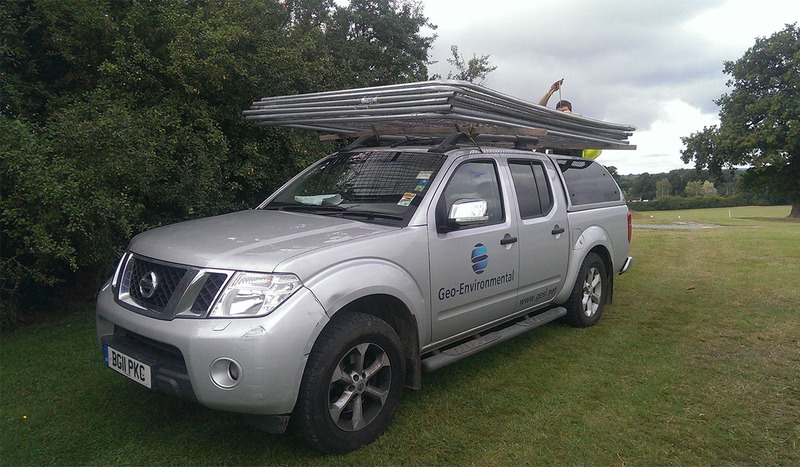 Geo-Environmental have invested in ISO9001, ISO14001 and OHSAS 18001 to ensure that our clients know that when we undertake site investigations is reduced. Our approach reduces issues later in development and this can save our clients time and money.